Navigating down the curved hallway of brown stone deep within Deimos Lab, I notice an irregularity in the angle of the wall. Upon closer inspection there’s a small hole in the floor: a passage down. At the bottom of the passage there’s a hidden room containing only a plasma rifle and a teleporter. I pause for a moment to steel myself for whatever comes next. Doom never gives you anything for free. I step on the blood-red teleport pad to be whisked away to destination unknown. As the green energy burst fades I check my map and confirm that this is a room I haven’t discovered before. Directly in front of me stand two large demons within arm’s reach: A Pinky and a Cacodemon. They don’t know I’m there yet so I weigh my options against my meager supply of ammo. The room is too small for rockets, my shotgun will be too slow, and I have barely any bullets. Guess there was a reason I just got a plasma rifle. Taking them both of them out used about a fifth of my cell ammo and I can still hear more demons somewhere nearby. After checking the small room for and failing to find any hidden features, I slowly walk down a curved hallway and reach an intersection with another corridor. The chorus of grunting is louder now. There are more than a few enemies nearby. My health is 44 percent and I have fewer bullets than I’d like, but how bad could it be? I dash out, gun blazing, mowing down a pair of imps with ease. They weren’t alone. Three more imps send fireballs my way and a burst of pink plasma heralds the arrival of a trio of Cacodemons floating down from the ceiling. Running away to gain some maneuvering room brings me face to face with not one but two Barons of Hell! As their green energy projectiles sail towards me I run back towards my entry point, making the unfortunate realization that this narrow corridor I’m trapped in is nothing but a circle. With nowhere to hide I start firing off everything except my rockets, not stopping to be meticulous. After what feels like an extended engagement both my guns and the demon horde is silent. Narrowly avoiding death, I claim victory – for now. My health is down to 23 percent, my supply of ammo is lower than it’s ever been; only 4 rockets and 39 shotgun shells; and once again my only means of progress is to step on a teleporter to destination unknown. When it seems like I don’t have any options left, I realize I have the same option that I always had: kill more demons. I still remember my first exposure to Doom. Sometime in the summer of 1994 Jon, a friend of my oldest brother, brought a “legitimate” copy of the game over to our house. He installed it on our family computer and introduced us to the plight of that single green-clad marine waging a hopeless war against the spawn of hell. Many moments from that fleeting demo are permanently etched into my gaming memory. The nervous sideways glances of the Doom guy. Exploding barrels of green goo. A pulse rifle with a sound I can only describe as an “electric rebound”. Floors a shade of blue not seen in real life. The anguished moans from zombies after you graze them with a shotgun. The frighteningly weird hiss of the floating red Cacodemon. My brothers and I loved it. My parents hated it. After the evening’s dinner was finished and Jon went home my parents broke their polite silence, “Get rid of it”. The battles of the Doom guy would have to be waged in someone else’s home, at least for a little while. Over the years Doom and I had an on again, off again relationship. Sometimes it was upstaged by shinier and more fancy games. Sometimes I was just too busy to bother with it. Sometimes I thought it was too simple for me now; compared to new games old Doom was just kid stuff. And yet, Doom has always been there. Somehow, id’s pioneering shooter from the early 1990s has proven its staying power time and time again. After paying attention to the little details on my last playthrough I can confirm one thing for you: Doom is just as good now as its ever been. Given that video games are pieces of media that all too frequently tend not to age well, it takes a special combination of factors for one to provide an enjoyable experience both at the time of release as well as two decades later. But how is it that the various aspects of Doom managed to be cutting-edge in 1993 and yet not distractingly obsolete in 2016? In short, the game’s many components are finely designed with an elegant simplicity that manages to capture an essence of timelessness. What matters here is not so much the obvious age of the technology or gameplay mechanics that may seem basic when compared to modern titles; what matters is that Doom fully utilized the best tools of its time to create a cohesive whole that was complete in and of itself. Great visual design serves the whole rather than detracts from it, and that statement holds true no matter how old the design is. Doom’s visual design definitely evokes a feeling of art, abstract art in particular. Most of the game’s designs and specifically the level layouts are open to subjective interpretation. It’s something you examine for a moment and while it doesn’t necessarily bear an immediate resemblance to anything in particular, the intention of the artist is unmistakable. 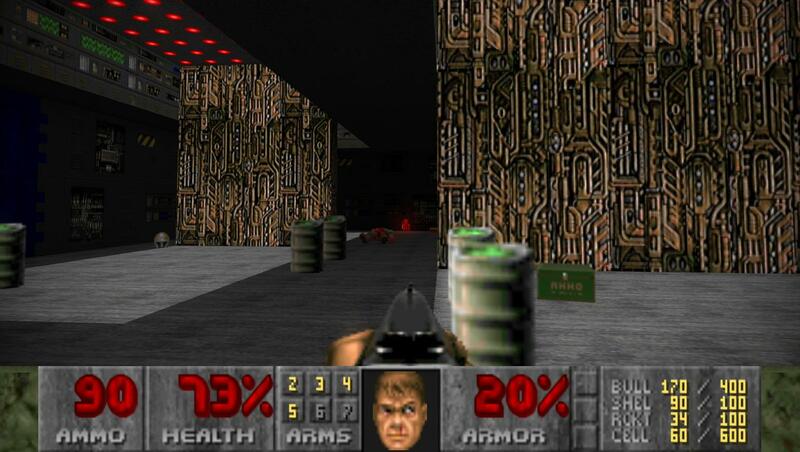 Sure, there are levels and areas that definitely try to look like something, but either through the lack of graphical fidelity or intentional design decisions you’re never looking at something and think to yourself, “Man, they screwed that up.” It’s a large part of why Doom is still tolerable today. You can play through level after level without being constantly reminded of how poorly older gaming technology was able to replicate the vision of the artist. Your imagination can make these locations into whatever you think they need to be. 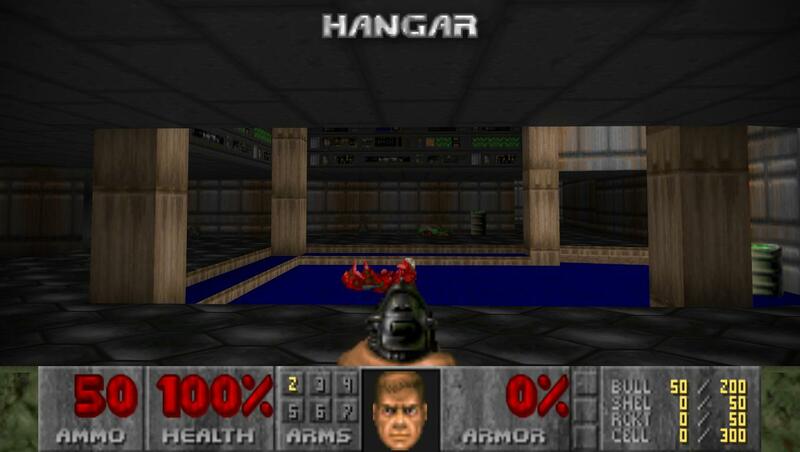 For a prime example look to the opening level of the game: E1M1: Hangar. Though this is arguably the most famous level in the history of first-person shooters, I’ve yet to see any explanation for why the level has the name it does. There’s nothing here that even remotely resembles a hangar. Nowhere is there a space large enough to contain a ship, an airplane, or any other spacefaring vessel. The only open space is filled with green toxic goo. And just why is there so much radioactive green goo around in the first place? Why in the heck are there golden candelabras near the exit? These and other questions will pop in the back of your mind frequently as you explore such locations as “Central Processing”, “Military Base”, “Spawning Vats”, “House of Pain”, Slough of Despair”, and “Tower of Babel”. Clearly, the level design was intended to evoke a feeling rather than to serve as an accurate emulation of any particular locale. The major difference between the levels of Doom and works of abstract art is that works of abstract art don’t try to kill you when you admire them. The opening levels of the game start with fairly straightforward and uncomplicated layouts; all that is required is for the player to navigate from the starting point to the finish and press a button or step on a pad to end the level. Additional hazards are gradually added into the mix. Some parts of a level may be sealed off and require you to find a keycard to gain access. Other levels are laid out like a maze, either by their physical layout or through the use of teleportation pads. Very frequently the level design embraces the game aspect of Doom and will throw you in the midst of all manner of traps, chokepoints, or other puzzles. The only resources at your disposal to help you navigate the often deadly labyrinths are your wits and a handy automap. There are secret areas containing weapons and powerups hidden in nearly every level. Some are marked by intentionally misaligned textures or offer other visual hints as to their existence, and others are implied only by a switch with no obvious purpose. If you wish, you can spend as long as you like exploring each area searching for hidden goodies. The only thing standing between you and passage to the next level is you. Here sits a lightly defended red keycard surrounded by a plethora of exploding barrels. Be wary. Be very wary. But I guess it takes a certain kind of imagination to dream up, or have nightmares about, what an army of hellspawn might be like. Doom paved the way in its design of enemies, creating the archetypes that are still followed today. Soldiers and Sargents are your nominal cannon fodder that can be surprisingly dangerous when you’re low on health. The brown, leather-skinned imp is the slightly tougher humanoid that hurls fireballs instead of instant hit bullets. Pinkies are your obligatory melee-damage-only enemies that can take a beating. Cacodemons are an aerial threat with a ranged attack in addition to being bullet sponges. Lost Souls are the original annoying enemy that combines small size, flying, and a shrieking rush attack that’s never fun to deal with. Barons of Hell are giant, lumbering brutes that hurl green plasma that explodes on impact for splash damage. There are bosses, too, but those are more fun to discover on your own. Prepare to do a lot of running. Photos don’t do justice to the enemy design in Doom. There’s just enough of a convincing menace in the animation of your foes that you will feel threatened by them, sooner or later. If visuals alone don’t do it for you, the aural experience will. While the sound effect library is small by today’s standards, the engineering is perfect for conveying the tortured nature of the beings you’re dealing with. This is due in large part to the use of animal sounds where one might expect to hear sounds recorded by humans. From the anguished moans of the shotgun-toting Sergeant to the hiss of the Cacodemon to the bizarre trumpeting call of the Baron of Hell, the sounds of Doom effectively convey that you do indeed battle against an army that is not of this world. Sometimes, the enemy of your enemy is your friend. Your foes in Doom can and will become embroiled in fights between the ranks, and it’s always a good idea to do what you can to encourage those fights. Before long you’ll learn to use your speed to try and catch different types of enemies in their own crossfire. Once one enemy retaliates against another all you need to do is stand clear and watch the survival of the fittest. Doing this is usually just a bonus, but there are a few maps where causing this infighting is absolutely essential to your own survival. Notice that I haven’t fired a single shot here. Also essential to your survival is learning to master Doom’s arsenal, though it really is pretty intuitive. At your disposal are your fists, a pistol, shotgun, chaingun, rocket launcher, plasma rifle, BFG 9000, and a chainsaw. Each weapon has its own set of strengths and weaknesses, that lend themselves to particular situations. The pistol, while seemingly useless, is a good choice for long-distance engagements when you want to conserve ammo. Your pump-action shotgun, now a mainstay in first-person shooters, is a good all-around weapon that just can’t fire fast enough when the hordes are thick. While each bullet of the chaingun doesn’t do a lot of damage, the continuous-fire nature of it serves to “interrupt” the attacks of your foes, and can buy you some much needed time to maneuver. Rocket launchers are not good to use in confined spaces. Ever. Doom’s rockets also move with a conspicuous slowness which can mean it’s not the best for long-range engagements. The plasma rifle is a versatile weapon that’s good in any situation, provided you can find the ammunition for it. It works best when fired continuously, as letting up on the trigger leads to a substantial reset time before you can fire again. When something or a small group of somethings needs to die right now, bring out the BFG 9000. It’s slow rate of fire and slow projectile movement gradually unleash a green firestorm of devastation, but it really works best in relatively small environments. And then there’s the chainsaw. For a long time I thought it was only a weapon of desperation, but there is actually a strategic use for it. When dealing with melee enemies, Pinkies or Lost Souls, work your back into a corner and let them come at you. The chainsaw will do the work for you. Doom’s shotgun is the best ever. Period. There’s certainly more that could be written about Doom: the movement mechanics and how the Doom Guy is able to run at a constant 30 miles per hour, how throughout the campaign you never really notice the technical limitation that prevents vertically crossing layers (there can’t be one story of a building directly over another), the story set-up present only in the game’s paper manual, the implied narrative and geographical narrative movement in the level design and loading screens, and more. To try and do all that would require a whole series of posts, and while I’m open to exploring those topics more in depth to do so here would distract from my main point. And my main point is: Doom is still around for a reason. One of the first games of its kind, it’s still one of the best of its kind. It’s just as fun in 2016 as it was in 1993; and that’s saying something. Granted, it’s not for everyone, but anyone who considers themselves a gamer owes it to themselves to play at least the shareware episode of Doom. The original game works flawlessly on modern computers, but it’s just a bit too ugly for my tastes. Thankfully the Doom community has been able to make a lot of improvement to the game engine, allowing for higher resolutions and better visual effects. The two most popular upgrades are GZDoom and Doomsday Engine. GZDoom will give you an experience that’s a bit closer to the original game, but I slightly prefer Doomsday Engine since it allows for unrestricted mouselook. Both are worth a look. Play it on a difficulty that’s hard for you. It makes the game more interesting and will help you write your own stories within the world of Doom. I played it through on Ultra-Violence and enjoyed a good challenge. Be forewarned that the difficulty jumps by a noticeable amount when you get to the fourth episode: Thy Flesh Consumed. Circle-strafe. Move sideways and keep your enemy in the crosshairs to literally run circles around them. It’s an essential skill to learn if you want to survive. Everything is a trap. See a keycard? Trap! Is there a button nearby? Trap! Has it been more than thirty seconds since you last encountered an enemy? Trap! Always be ready to move and shoot. DoomGuy is fast. So fast, he’s able to almost outrun rockets. This should make you very, very afraid. A long corridor with nothing going on is usually a sign that a lot is about to be going on. Heh. That’s about to be a direct hit. So, some areas are kind of disturbing. This is one huge and complex level. I could be wrong, but I think this is the way out. 37% health and a few rockets against about twenty Lost Souls. It’s almost a fair fight. I think there might be a secret area around here. When a giant arrow is pointing to button, be wary. How’s it hanging? Yeah, this is disturbing too. E4M2. This is an episode that will challenge even seasoned FPS veterans.